I heard about bump keys recently, and had a little time to play around this morning. I read an article about them, and watched a youtube video, and away I went. 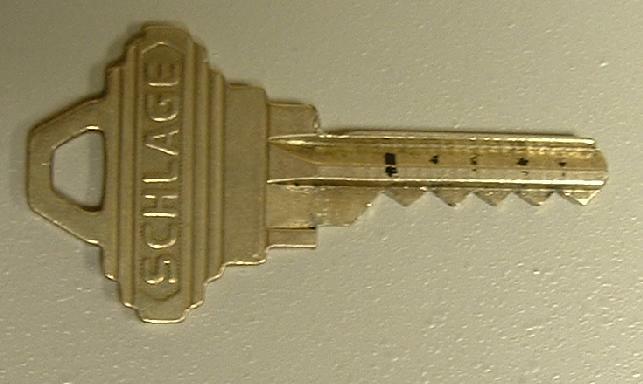 It took about 15 minutes to hand-file a key. And then another 20 minutes to try the "pull-back" method, file the key a little more and switch to the "minimal-movement" method, spray a little WD-40 in the lock -- tada! I was kind of surprised that it actually worked. I tried again, and it took me maybe 10 minutes to open it. You have to bang harder than you might expect. The next time was maybe 2 minutes, and then 30 seconds. I switched to the door handle (I had been working on the deadbolt -- there apparently is some risk of breaking the lock, and I figured if I can only choose one lock to have working, I would rather have the handle lock working) and I opened it in about 10 seconds. I am not going to run out and buy new locks, but it is interesting that you can do it. I hadn't really realized how a pin-tumbler lock worked before. There is actually a good bit of physics involved - so I guess that means we should teach it in our schools. Heather didn't really believe that a key that looked like that could open our door. Wow, and I can't even make the right key work often time. It was great to read the pdf article you linked to. I discovered I wasn't picturing how the pins worked correctly. Now I know. I was looking at this "problem" and from what I remember, locks with tighter tolerances, ie more expensive ones, are MORE prone to be opened in this way. Yes, that is what the articles I saw have said. @jondaley This is a BIG problem. It's particularly bad when sites like http://www.bumpkey.us actually sell these damn things to just about anyone that wants them! Someone pointed out the other day that this would be a great spare key to hide outside under a rock, etc. Rather than hide a "real" key, hide one of these. That way, even if someone found it, they still probably wouldn't know how to use it. Allen: I have been thinking about various different ways of making a bump key proof lock. I guess there are different budgets, so it isn't possible to get a one-size fits all lock, and there are various tradeoffs in complexity, cost and security. It seems like the best solutions involve multiple locks, which is then a pretty big pain, at least for me. I probably should write some articles on the different locks I have been thinking about.